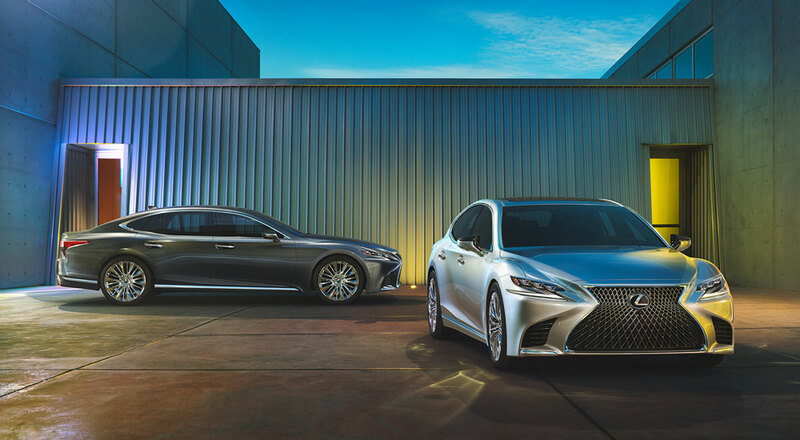 Lexus has announced a full suite of new safety features that will debut with the new LS — called Lexus Safety System + A, the new technologies will add a degree of semi-autonomous driving assistance to the flagship sedan. The amount of information here is staggering and will likely take some time to absorb. The press release mentions that the new system will be available in Japan, North America and Europe, but the specific markets have yet to be confirmed. The new LS is equipped with Pedestrian Alert, a world-first technology that can identify the walking direction of a pedestrian, and Active Steering Assist, which can automatically controls steering and braking. If the system detects a possible collision with a pedestrian, the LS heads-up display will display the direction of the pedestrian. 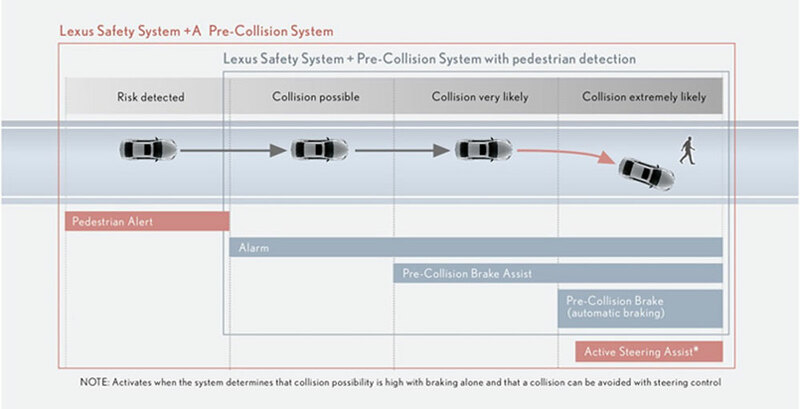 Should there be a high possibility of collision with a pedestrian or a continuous structure like a guardrail that can not be avoided by assisted braking alone, the system will automatically steer away from the obstacle along with activating an alert and applying the brakes. 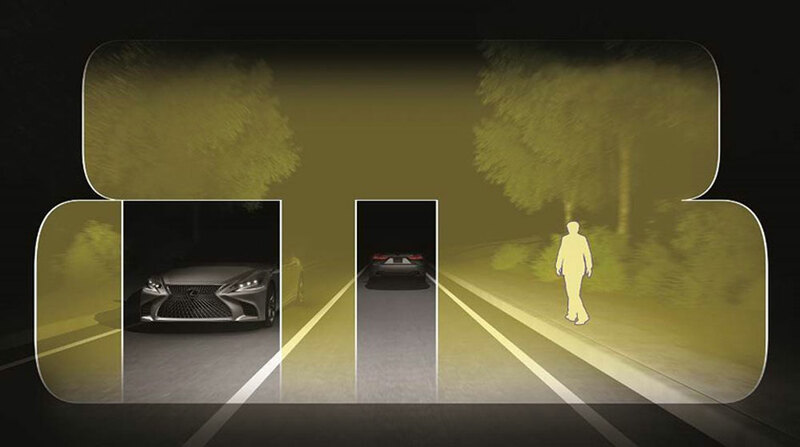 Lexus CoDrive adds Lane Change Assist (LCA) and Lane Tracing Assist (LTA) to assist steering the driver on highways. It coordinates with the LS’s HUD and multi-information display to clearly notify the driver of the state of support provided. Lane Tracing Assist will keep the vehicle inside its lane while Adaptive Cruise Control is in operation. The system uses a camera to identify lines on the road and traces the path of the vehicle ahead even when lane lines cannot be recognized. It can also calculate the speed of a curve in the road using navigation data, and will alert the driver while automatically slowing the vehicle down. Lane Change Assist uses the driver’s turn signal as a cue to activate automatic lane changes. This is done by monitoring the surrounding road environment and, at the appropriate timing, controlling steering, a`cceleration and deceleration. Should a driver disengage from driving while Lane Tracing Assist is active, Driver Emergency Stop Assist will issues audio and visual alerts while gently decelerating the vehicle. It will then activate the vehicle’s hazard lamps and horn to alert those outside the vehicle to help prevent or reduce damages to the vehicle or to others, while slowing and eventually stopping the vehicle within its lane. After stopping, it unlocks doors and activates an automatic HELPNET connection for a rescue request. Each LS headlight is equipped with a row of 8 LED lights at the top of the assembly and 16 at the bottom. The Two-stage Adaptive High-beam System provides optimal lighting by separating on/off control of each row of LEDs, enabling finer control of light strength and distance. This allows higher frequency of high-beam driving without blinding preceding or oncoming vehicles, thus improving nighttime visibility. To help prevent collisions at intersections, FCTA is meant to detect forward cross-traffic vehicles. It uses forward direction radar and is the first in the world to alert drivers of the oncoming vehicle’s direction. Alerts are displayed using the LS’s HUD, and should the driver ignore this message, warnings are also issued by a buzzer and the LS’s multi-information display. RSA acquires road sign information using a camera and navigation maps and then displays the signs using the LS’s HUD and multi-information display, thus reducing driver failure to recognize signs and encouraging safe driving. With the aim of reducing damage from accidents when parking, low-speed braking support systems have been integrated into a single package. Intelligent Clearance Sonar (ICS) and Rear Cross Traffic Auto Brake (RCTAB) is the world’s first rear pedestrian detection, and in the case of a possible collision, will assist to minimizes damages by using alerts and brake control. Side clearance view and cornering view functions have been added to the Panoramic View Monitor, providing new angles for viewing the vehicle’s position. These assist in confirming safety when making left or right turns on narrow roads and in preventing the driving up onto curbstones when departing the roadway. The Digital Rear-View Mirror shows the image captured by a rear camera on a built-in display in the rear-view mirror. This provides an unobstructed rear view, and will enhance visibility at night or during rainy weather. A switch can flip modes between the optical mirror and digital mirror.